A simplified defence for youth, see Defences - Gap, Pack line. 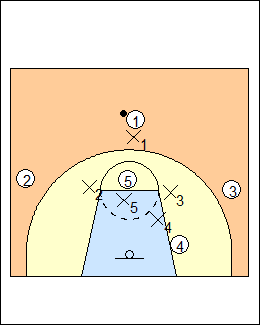 All five players sprint back to defend, stop the ball somewhere around the 3-point line, with hands high then down and wide (if X1 comes out too far, 1 will go around him). With the ball at the top, all off-ball defenders are in help positions in relation to the ball. On a drive to either side, X2 or X3 would jab step toward the ball and get back to their man (stunt and recover, it's not a double team). 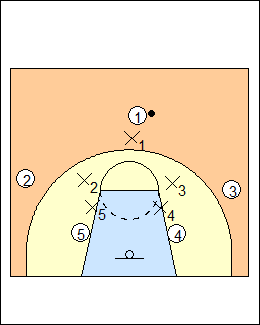 X4 and X5 are up the line on 4 and 5, there has to be ball pressure to help prevent a lob pass. All defenders see man and ball. All defenders jump to the ball on any pass, it's team defence. With the ball on the wing, X2 shades baseline, channel everything to the middle, never give up the baseline. X1 is in a position to help on a middle drive (they don't deny ball reversal), X3 is two passes from the ball, has one foot in the paint, or can come over no further than a line between the two baskets. 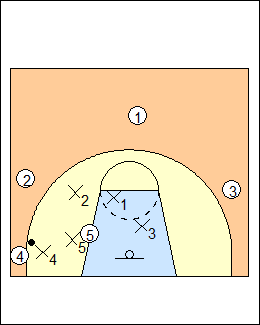 X4 is three passes from the ball, in the lane. When a shot is taken, everyone locates their man and boxes out. 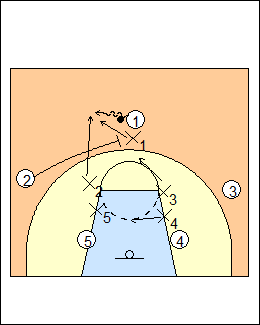 X5 plays 5 on the high side, one step in front, together with X2 shading baseline they make it difficult to get the ball into the post. If the ball does go into the post, X5 is behind 5, ballside X1 and X2 collapse and dig on the post (dig with hand up to avoid fouling, not hand down). Dead front the post with the ball in the corner (the only time). 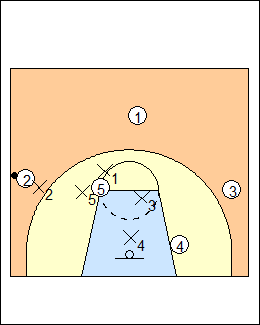 With the ball on the wing and 5 at the elbow, X5 plays low side, one hand in the passing lane. With the ball out top and 5 at the high post in the middle of the foul line, X5 plays behind, X1 would dig on a post feed, X2 and X3 may stunt. The only time they switch is a cross-screen in the lane. A downscreen is the most common screen. X5 is up the line, hard to screen, and follows 5 right around the screen by 2 (fight through the screen). 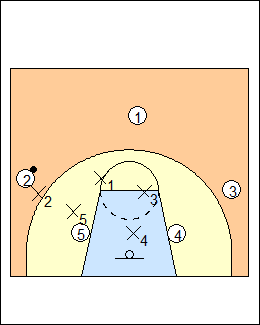 Double-team any ballscreen outside the lane.